In 2014, the first three volumes of Heidegger’s Black Notebooks—the personal and philosophical notebooks that he kept during the war years—were published in Germany. These notebooks provide the first textual evidence of anti-Semitism in Heidegger’s philosophy, not simply in passing remarks, but as incorporated into his philosophical and political thinking itself. 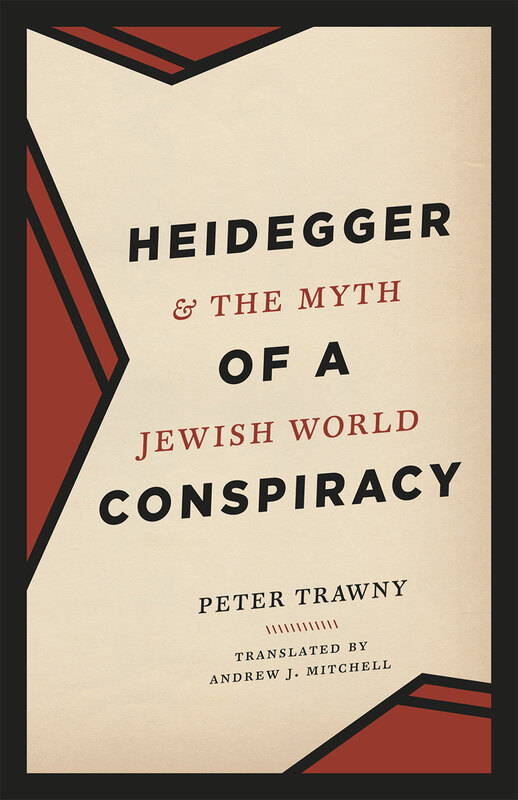 In Heidegger and the Myth of a Jewish World Conspiracy, Peter Trawny, the editor of those notebooks, offers the first evaluation of Heidegger’s philosophical project in light of the Black Notebooks. While Heidegger’s affiliation with National Socialism is well known, the anti-Semitic dimension of that engagement could not be fully told until now. Trawny traces Heidegger’s development of a grand “narrative” of the history of being, the “being-historical thinking” at the center of Heidegger’s work after Being and Time. Two of the protagonists of this narrative are well known to Heidegger’s readers: the Greeks and the Germans. The world-historical antagonist of this narrative, however, has remained hitherto undisclosed: the Jews, or, more specifically, “world Judaism.” As Trawny shows, world Judaism emerges as a racialized, destructive, and technological threat to the German homeland, indeed, to any homeland whatsoever. Trawny pinpoints recurrent, anti-Semitic themes in the Notebooks, including Heidegger’s adoption of crude cultural stereotypes, his assigning of racial reasons to philosophical decisions (even undermining his Jewish teacher, Edmund Husserl), his endorsement of a Jewish “world conspiracy,” and his first published remarks on the extermination camps and gas chambers (under the troubling aegis of a Jewish “self-annihilation”). Trawny concludes with a thoughtful meditation on how Heidegger’s achievements might still be valued despite these horrifying facets. Unflinching and systematic, this is one of the most important assessments of one of the most important philosophers in our history.